American has just completed its biggest Great Backyard Bird Count ever and in our Indian River neighborhoods we had 13 checklists submitted from 6 observers. Together they identified 48 bird species. Birds on everyone's checklist included the Carolina Chickadee and the Northern Cardinal. One of the more rarely reported sightings was a quartet of Greater Scaup ducks. The group had a real treat at our meeting on Feb 14 as Anita and Anne from Wildbirds Unlimited talked to us about backyard birding - and even left us with some treats to share with our feathered friends. We also discussed moving our meeting date and narrowed our consideration to the 1st Wednesday of the month starting in September. Our next meeting will be Thursday, March 14 and Pam Fisher will be talking to us about Bees in our Garden. 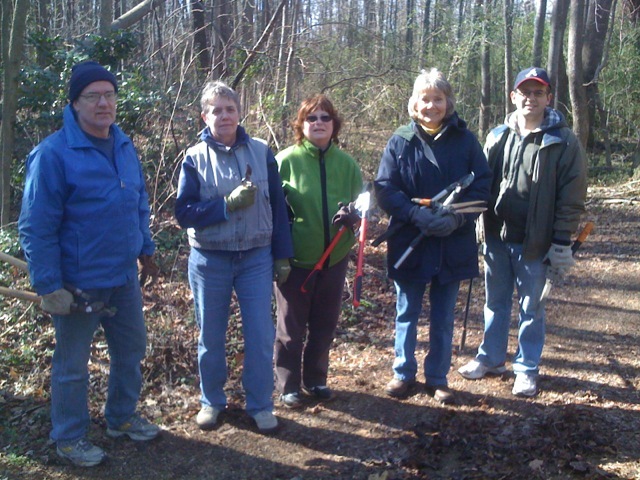 On Saturday, March 16 we will have a volunteer event for our quarterly Adopt-A-Road cleanup along Indian River Road. If you do participate in the count, send a copy of count to info@friendsofindianriver.org. We would love to have a cumulative count of what was reported in our area. Update: We had another productive work session in Indian River Park this morning. Six of us used the morning to clear English Ivy from the trees across another acre of the park. That means dozens of trees that won't be smothered or host berry producing ivy. Next Saturday, February 9th, at 9 am, we're going to have another volunteer event to tackle another area of ivy in the Park . We'll be meeting at the park parking lot at Rokeby Ave. and Main St. (on the south side of Military Highway away from the firehouse). Wear long pants, close-toed shoes, and bring work or gardening gloves. Bring pruning clippers, loppers, screwdrivers (which are amazingly useful in prying ivy off tree trunks) and/or pruning saws if you have them.